I have to admit that when I first bought this color I was a bit disappointed. I had been looking for a darker color. I’d looked at various scans and thought this was darker. Well, it’s not, but over time I’ve actually come to really like this color. I’d describe this color as a medium Turquoise color. There isn’t any green in the color. it’s dark enough to read comfortably. Darker than Skrip Peacock Blue, Visconti Turquoise, and MB Turquoise. It behaves pretty well in pens. The flow and lubrication are absolutely excellent! 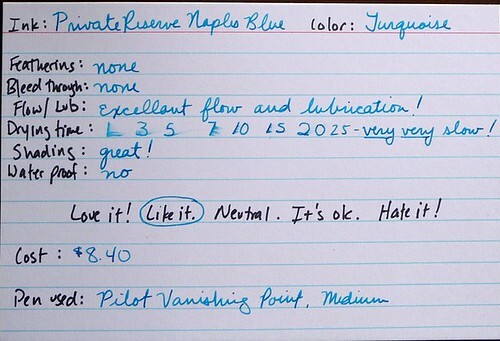 While this ink is not waterproof (as noted on the card) it is water resistant to a degree. Certainly resistant enough to survive a spill. Now the only drawback I see to this ink is that it is VERY slow drying on anything but cheap copy paper. On this card it took 25 seconds. I believe this is probably the slowest drying ink I have! So, lefties beware. There is a huge potential for smearing with this ink. All in all a great turquoise.